Most businesses don’t try to revolutionize their industries, let alone change the world. But as we head into 2018, a small group of startups is doing just that. 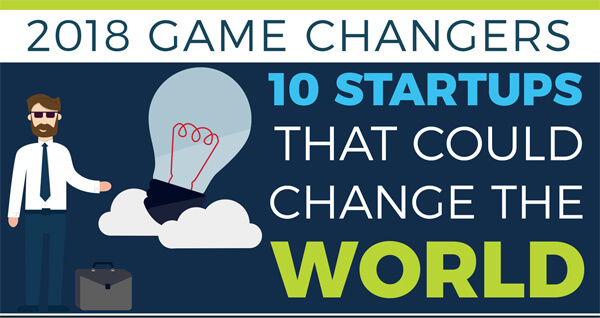 Brylak Law teamed up with James Publishing to illustrate a recent study by CB Insights, listing 2018 Game Changers: 10 Startups That Could Change the World. From artificial intelligence (AI), to self-driving bulldozers, to rocket launchers (yes, rocket launchers), these companies have boldly identified solutions to some of the world’s biggest problems, like sustainable food production, public safety, and chronic pain. We’d call those game changers. And they don’t just have bold ideas. As relatively young startups, they have convinced some of tech’s top investors, including Bill Gates, the United States Department of Defense, and venture capital firms like Andreesen Horowitz, to give them over $1.2 billion in 2017 alone. While they might have significant funding, they now have to turn ideas into reality, build successful business institutions, and economies of scale. That’s a daunting task — we hope they’re up to the challenge. While we’re not sure whether they will become household names, some of these startups are certainly disrupting their industries — and developing technologies that are worth watching in the coming year. If you’re an entrepreneur who’s developing your own startup, use this list as inspiration. As you start 2018, give yourself the opportunity to dream a little bigger and push your creative boundaries.